where PAUC is the estimate of power for AUC and PCmax is the estimate of power for Cmax. Surely that's either wrong or an approximation that has some validity within a set of strict conditions. I have not read that work or reference 918, but it looks outright wrong. With that equation power could become negative, go figure. By the way, the term pooled in the first sentence is also weird. The variances estimates for Cmax and AUCt are not "pooled", but I think they meant that the pool is just the dichotomous set of two variances. » Surely that's either wrong or an approximation that has some validity within a set of strict conditions. I have not read that work or reference 918, but it looks outright wrong. some more sparse details. Unfortunately the Appendix D with a proof of that formula is not available in Gooooogle books. » With that equation power could become negative, go figure. 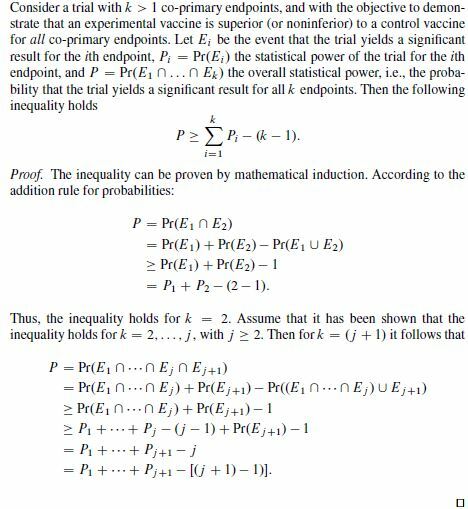 One nitpicking: The lower bound of power could become negative if both powers are <0.5, values no one would use in estimating sample sizes. If such a bound is reasonable is of course highly questionable. Seems there is no "validity within a set of strict conditions", but rather general validity. Pr(E1 ∪ E2), which is within 0 ... 1, the upper bound of that probability is used. interesting observation. Thanks for pointing this out. The formula is indeed very general and no assumptions are needed. Which makes it also (maximally) conservative. No adjustment is made for multiplicity of endpoints AUC and Cmax , and the larger variance of logAUC or logCmax is typically used in the power sample size calculations. To me such a formula (or another concept of overall power) makes sense in case we have for example 2 analytes. One should then adjust power regarding this multiple comparison. Often it is not clear how they are correlated and then I tend to assume they are independent to be on the safe side. Thus the overall power formula is power(analyte 1) * power(analyte 2) (in contrast to the formula from the book). It is interesting that even this rather conservative assumption of complete independence is slightly better in terms of higher power / requiring less subjects (as compared to the formula from the book). (I have no general proof of it at hand, but for the examples it was true). » Seems to me that the authors recommend to use the lower bound as criterion for setting the targetpower, i.e. if an overall power of 0.8 is aimed for, the powers for the two metrics have to be chosen such that the lower bound >= 0.8. Maybe I missed it but I don't see this statement explicitly. Can you point me to the direction? In case of the analytes example my personal target power would still be 90%. For sensitivity scenarios we can aim for 80 (ish). * Maybe this is not true after all, then the approach of taking an overall power would make sense to me. » interesting observation. Thanks for pointing this out. » » Seems to me that the authors recommend to use the lower bound as criterion for setting the targetpower, i.e. if an overall power of 0.8 is aimed for, the powers for the two metrics have to be chosen such that the lower bound >= 0.8. » Maybe I missed it but I don't see this statement explicitly. Can you point me to the direction? You are correct that there is no statement explicitly. The wording of the whole paragraph is not that clear understandable, to say it politely. Maybe I read to much into it. But the example "if power for Cmax is 0.90, and for AUC 0.95, the resulting overall study power is at least 0.9 + 0.95 - 1 = 0.85" smells for me in that direction.